I hate Transformers like this, it's a new name, a new bot, and there is NOTHING on the guy! I used that all mighty force stronger than the All-Spark called Google, and turned up nothing on him. Which means it's hard to give you the reader a biography on him. I'll use this space usually reserved for a biography and instead use it for a bit of a forward/bio I hope he gets. 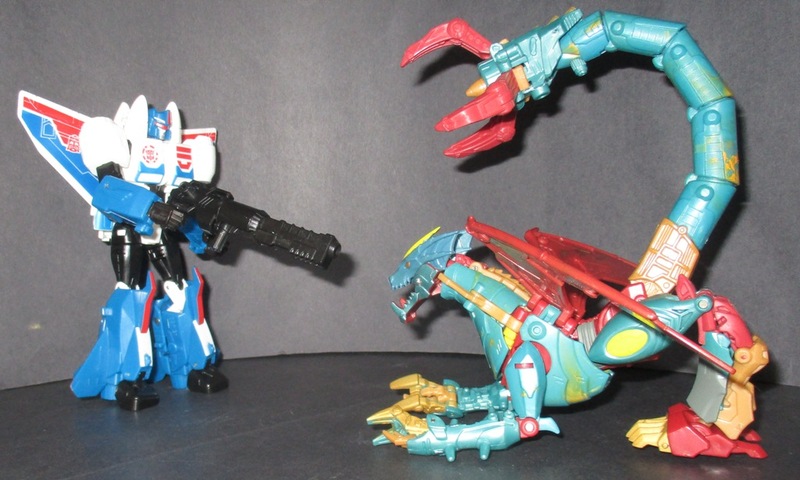 We all have toy lines where for one reason or another we're not a fan of, sometimes it's the show its associated with, other times we don't like the toys, and Robots In Disguise has been hard pressed to impress me, so why did I pick up Stormshot? Well, it wasn't because he was a shelf warmer, or because I never heard of the character. It was because I got this sense just from the box that said HERO. It was that little smirk of a smile on his lips on the box art that said either he'd be a Super Hero, that makes Bumblebee look like rank amateur in the Autobot's darkest hour, or Hero in the sense that he'd show up, and get blasted into a pile of scrap, but everyone else would pull together to save the day, and poor Stormshot as well. Either way he's going to be good, and a good seller in the US with his very patriotic paint job. Now I understand how as a reader, it can become boring reading the same break down of a bots articulation, so I am going to break out Mr. Fast-forward here for a moment. Stormshot has a standard range of motion of a Transformer toy in 2017, this means knees 90 degrees, arms can do 360s, and his elbows bend to 90, so sadly he can't look like he does on the box's artwork. He does have ball joints in his shoulders and hips, and I found both of them to be very tight. He's even well balanced enough I managed to get mine to do the crab dance with his arms in different positions. Remember how I mentioned how he said Hero to me? Well, it was also his paint job that got my attention. I've seen a load of Transformers where white is overdone, or too little and a bit more would help out. Here Hasbro found the right balance to give him that pop if you would to grab your attention, but by the same token used blue and red to fill in the rest nicely. 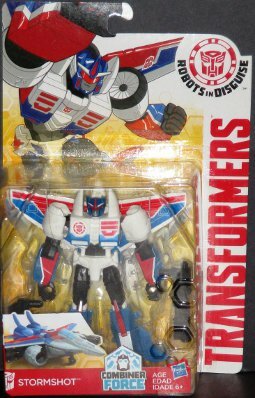 Alright let's talk shape, he reminds me (and a few others no doubt) of the G1 seekers with his inverted wings behind his arms, and wings on his feet, and yes you need to move those wings if you want to roll is arms around. I feel the chest is meant to inspire a manly barrel chest if you would from the way it's built. Those two towers next to his head are something I don't see a lot of. The head is dead on to the box one, one of a kind, just a shame he doesn't smile. Then again several other Transformers that smile on the box don't, so not the end of the world. Now big warning here, like the Beast Wars Deluxe action figures, Transformers Robots In Disguise figures have the instructions printed on the back of the packaging, so if you are like me and find part of the fun is to try and transform them without looking at the manual, well try to avoid looking at the back until you either do it, or give up and want the help. Now I found the transformation simple enough to do it without the manual, so I am not going to mention how it's done in this review. 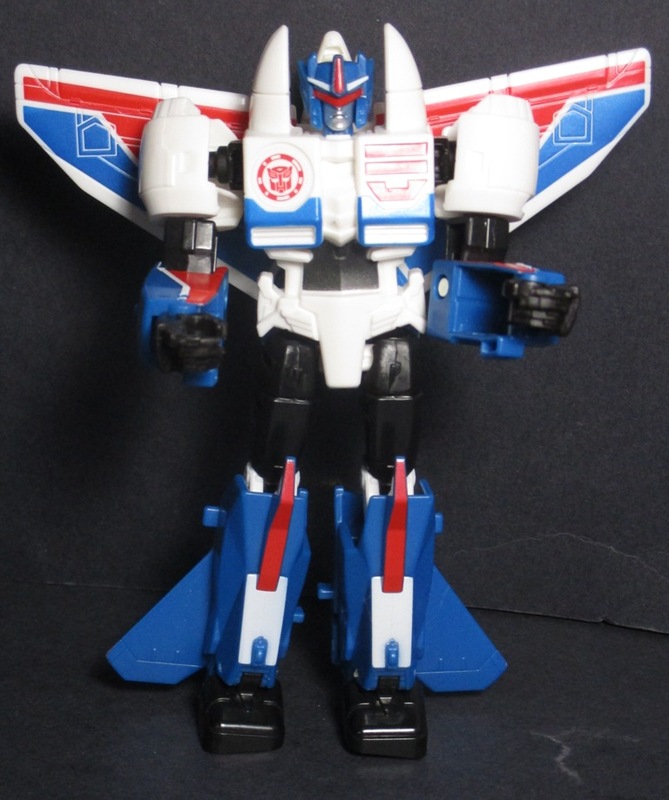 Let's go over how he looks as a jet, now for the life of me, I can't figure out what kind of jet Stormshot is suppose to be. It's not just the fact that his hands stick out in the back near the rear wings, and his shoulders only remotely pass as intakes for fresh air. It's the entire shape of the jet in question. The best thing I've got is Stormshot reminds me of a jet from UN Squadron. Something cartoon like, now as is to be expected he has no moving parts. I do want to briefly cover the underside, he's a typical Deluxe sized figure here, where you will see his robot front here. It's "hidden" in a sense since it is facing the ground, he has no real wheels except for a small none functional one up front. It does match up great with his head by the way, so neither part gets damaged. 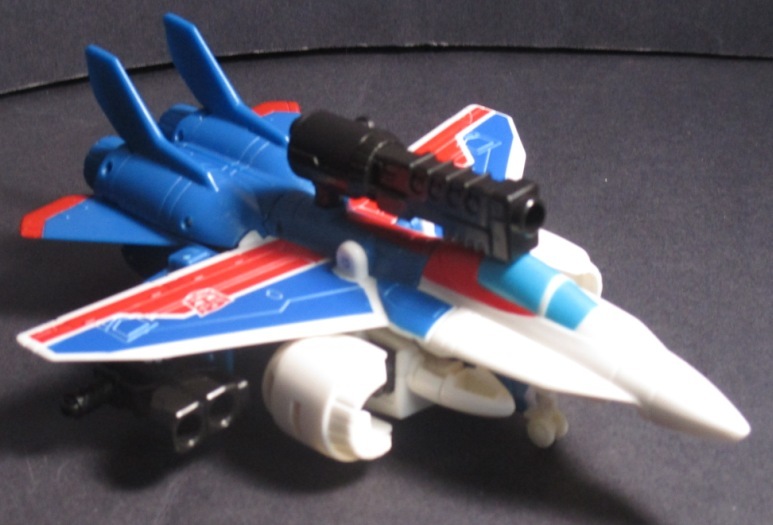 As a robot, Stormshot only has two mounting points for his guns, but as a jet, well he opens up a bit here. Mounting points on the back, the nose, and the wings, hey maybe it's part of his personality that he loves guns? All kidding aside, he has a revolver type gun, and something that is shotgun, and yes they can be combined. Just for a sense of balance I wish Hasbro had 2 of each type, by having one of each it takes away something from him. As great as his form is, well remember that killer paint job? Well, as a jet it looks washed out to me. Don't get me wrong here the back end is great, the main wings are so-so, and then it goes to die in the cockpit. The problem is they only have blue for the cockpit, and a white outline, it leaves the cockpit area looking fuzzy/undefined. Where even a bit say battleship gray might've helped give him some form here. Transformation Design 8/10 This is my first exposure to a Transformer from the Robots in Disguise line. While as an adult/old hand I could transform him in my sleep, I could see a child being challenged with it, but not enough to give up on him like some other bots I've seen over the years. Durability 8/10 Yup, I put him thought toy torture folks, but for him I even gave him one special test. I threw him 12 feet into pile of pillows when he was fully loaded. Hey, he's a jet, so it's expected of him and he passed! The only part that MIGHT break off is a pair of tabs his arms plug into his leg, something that even if it broke off is not vital as to render him unplayable. Fun 8/10 Nope, I am not being lazy here folks, but right on the money. As a robot his great look makes him fun to play with, and as a jet. Well, I understand how the purists will say "he's not based on a real jet, he's not fun". He's one of the unseen (so far) characters in a cartoon show, so it makes sense he looks cartoonish as a jet, and he does meet the criteria of fun to play with as a jet, even if there is some room for improvement via his accessories. Aesthetics 8/10 My usual grounds of comparison are gone to define how he looks, given how this is Stormshots first appearance ever. He looks dead on to the box art, except he lacks a smile, which is sad given how much that smile says about him. As a robot he looks great, like he helps define how a Deluxe sized action figure should look. It's only when we go to robot mode that he takes a nose dive, given how poorly his robotic parts are hidden, and that horrible paint job on his nose. Articulation 7/10 As a robot, he's par for the course of modern Transformers (as of 2017). He can hold a load of poses, and is easy for his body parts to move. He can't really spin his arms 360 degrees, but hey he has a huge pair of wings there so give him break, I am. 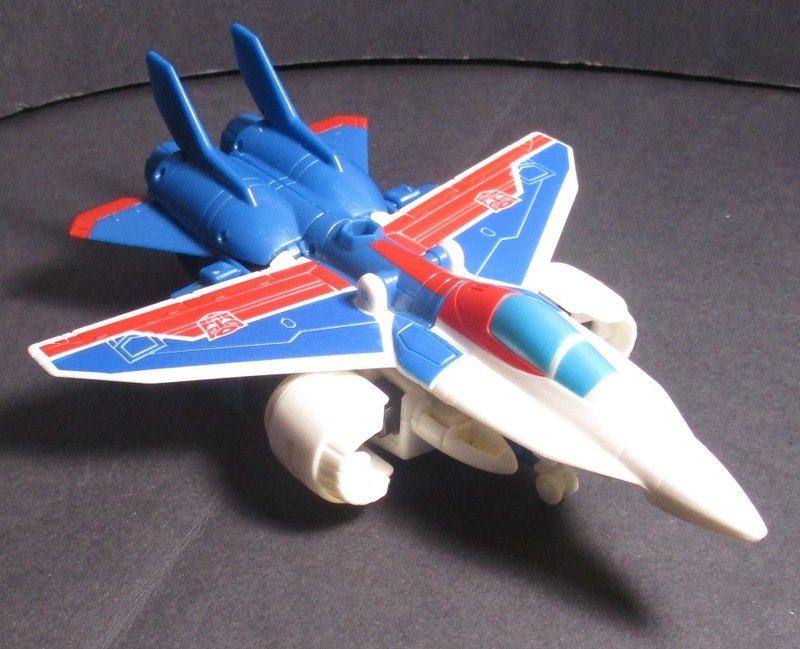 As a jet, he only has one part that could've been made able to move, which is a front wheel, and I can see why Hasbro didn't make it moveable given how it represents a potential choking hazard. Value 4/10 Recently local retailers increased prices on Deluxe sized figures by 25%, which is the only reason this score is low. He retails for about $20.00 Canadian, and at that price, there should be more that comes with him, or he should be able to do more, something to blow me away. It's one of the reasons why I passed him by so often without buying him since my wallet didn't like the price. Overall 72% not bad, not great, but not bad. Yes, he has his bad points however there is nothing here I absolutely hate about him. I can see young child having a blast with him as Stormshot comes to the rescue, or a collector.